Art Matters: Something Borrowed--Something New? This post heralds an exploration of William Glackens’ work. In a larger sense, however, I want to evaluate Dr. Barnes’ summary of American painting. In 1925, in The Art in Painting, he said, “…painting in America has followed so closely the European traditions that a distinctively American form of painting does not exist.” (336). To this, add the following. Dr. Barnes and William Glackens often looked at pictures together. 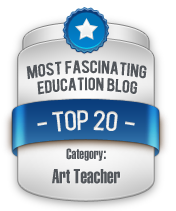 Barnes acknowledged his “tutelage” by Glackens in 1915, when he said, “The most valuable single educational factor to me has been my frequent association with a life-long friend who combines greatness as an artist with a big man’s mind.” (Quoted in “How to Judge a Painting,” Arts and Decoration 5, no. 6 [April 1915], 248). 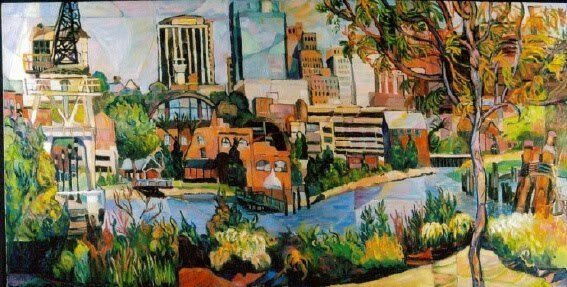 As you can tell, this is an ambitious undertaking, and unless some other topic catches my interest, I expect to pursue it for the next few months, motivated also by the necessity to build a course in Glackens’ work to coincide with the exhibit opening at the Barnes Foundation on November 8, 2014. Violette de Mazia provided, as she called it, a “Glackenspiel,” a four-hour class lecture later published in 1971 as a 27-page essay, “The Case of Glackens vs. Renoir.” (The Barnes Foundation Journal of the Art Department, Vol. II, No. 2, 3-30). In this essay, she did what Dr. Richard Wattenmaker said few writers pointing out Glackens’ debt to Renoir did (see American Paintings and Works on Paper in The Barnes Foundation, 67-68). De Mazia described and evaluated Glackens’ work by comparing, picture to picture, what Glackens borrowed from Renoir and other painters. She also showed how Glackens transformed his borrowings into something new. That’s what we will do—picture to picture—the objective way to determine creativity. 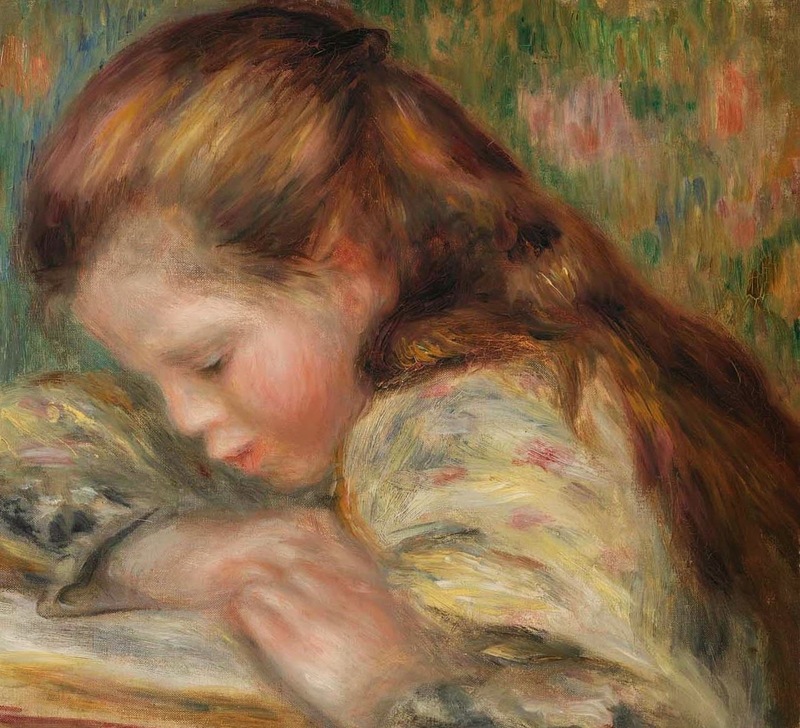 I decided to start with the following two paintings because, in March, when I saw Glackens’ picture, Lenna Painting, in the permanent collection of the Museum of Art Fort Lauderdale (MOA/FL), I immediately connected it to Renoir’s painting Child Reading at the Barnes Foundation. 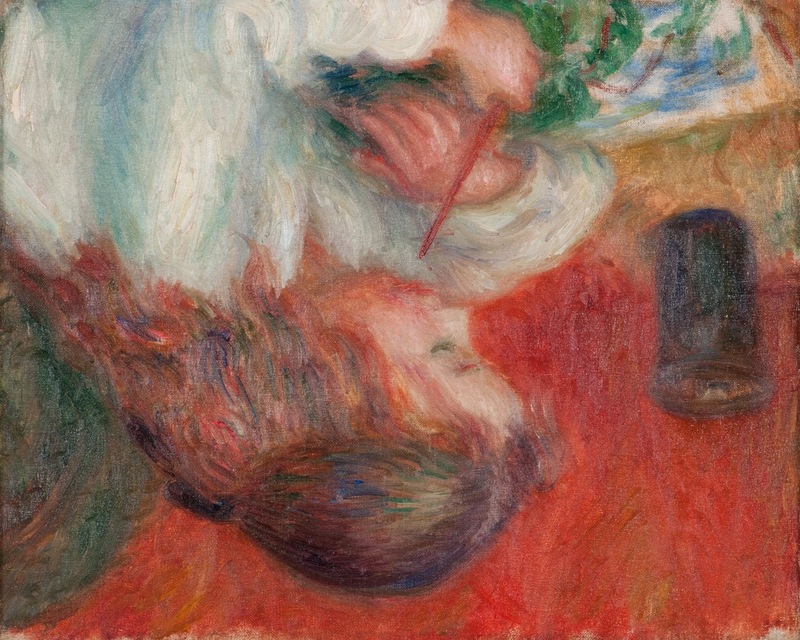 At first glance, those who said Glackens imitated Renoir had a point. The subject facts are remarkably similar: a young girl with flowing auburn hair leans on her arms and paints a picture or reads a book. Both compositions profile the “girl” in a pyramidal composition. Upside down, the Glackens' picture contrasts a fiery red background with a cool gray-blue “blouse,” flattens volumes set in shallow space, sandwiches objects, and arranges color units in circular motifs . 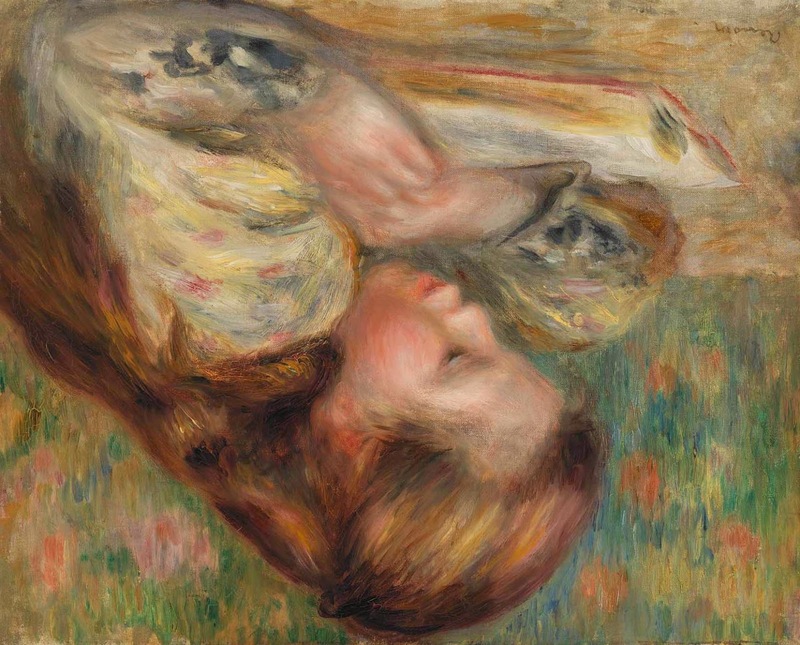 The Renoir picture orchestrates a vertically oriented background with a horizontally raised foreground. This squeezes the figure into a clothespin-like taut volume of soft, round, warm, luminous color in relatively deeper space. I noticed only similarities in “style,” in length, and in brushstrokes. I wondered if, indeed, this was going to be a very short post. A part divides the “top of the head” color unit in the Glackens. The left side of the part curves like a parenthesis to the right; the right side, wider and rounder, bulges like a deflated balloon. On the left, “strands” of color lines hang in space. On the right, strands of color ripple and flow diagonally downwards from the soft mound above in brown, green, red, tan and orange “strands.” The effect is wooly, like that of a Raggedy Ann doll. A banana-like volume and a larger triangular mound divide the “top of the head” color unit in the Renoir. A tiny wisp of a curl hangs down on the far left. A softly curvilinear diagonal cascades the remaining “hair” downward to the right, with an arabesque tendril hugging the shoulder before the color unit continues its downward flow. The “hair” unit shimmers with highlights of gold, pink, and soft orange contrasted with darker shades of brown and black. Since both cropped pictures display the faces as well, I studied them next. Here the differences are more pronounced. The Glackens’ profile is flatter, more sharply delineated, and closely related to both the background red and the shoulder. A slight, green-gray shadow barely separates the tip of the nose to the chin from the blouse. The Renoir profile, however, gently moves from forehead to chin in a series of in and out triangular wedges. The darker green-gray shadow to its left creates ample space for this three-dimensional volume to be suspended in space while, at the same time, be cushioned by the “billowy” arm to its left and the larger, rounder, more solid bulging shoulder to its right. Cradled on both sides, it hangs in the space in a quasi-rosette pattern that includes the hands. I hope you let me know your reaction when you first examined these two cropped and enlarged sections. In the Glackens, the “hands’ move to the left and right, the greens and whites surrounding them enhancing that movement with wisps of pulled color bands undulating around and between them. 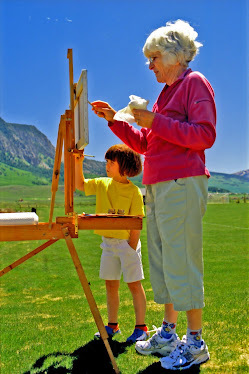 The paintbrush sets each color unit forward or back, and its tight, vise-like “grip” in the child’s grasp feels palpable. 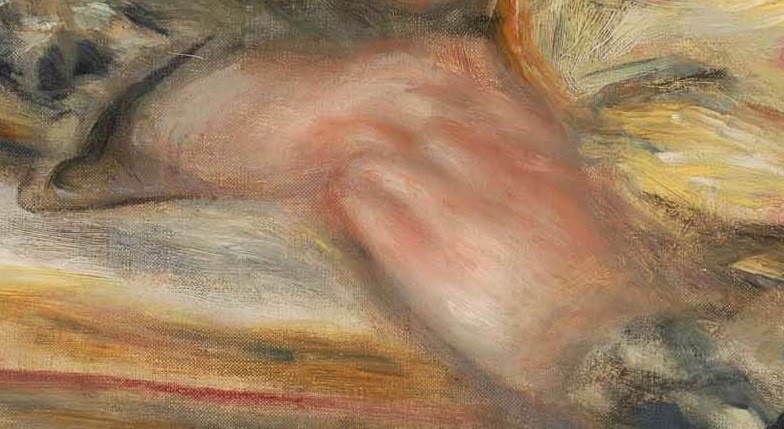 In the Renoir, two mitt-like soft, luminous round “hands” rendered in a prayer-like triangle, and packed in closely by shoulder, book, and sleeve, are motionless. 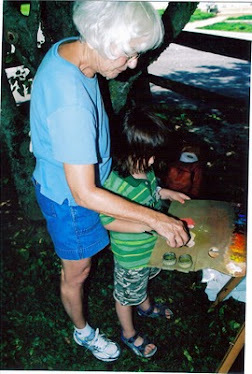 Stated simply, both pictures exhibit each artist’s delight in the subject of a child busy painting or reading. Aesthetically excited by the colorful aspects of life, Glackens stresses the moment, the here-and-now sense of actuality, of crisp gentleness, zest, and energy. 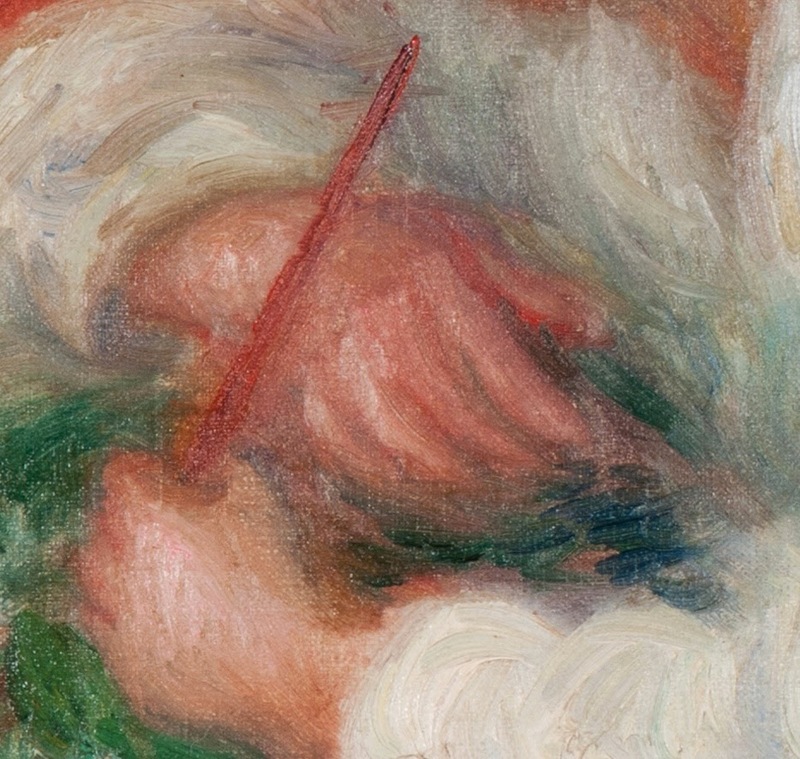 The endeavor of a child painting, for Glackens, becomes that child, those hands, that paintbrush. 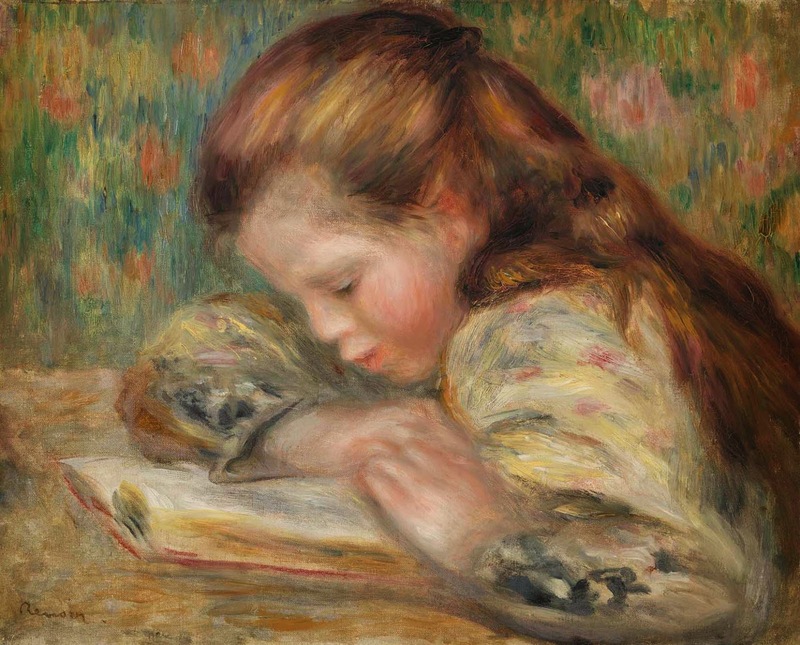 The endeavor of a child reading, for Renoir, becomes a series of lush, warm substantial color volumes coiled in deep, colorful space. As we continue to explore Glackens’ work, we will further define his relationship to the Impressionist tradition, his stress on the illustrative character of a picture’s subject, his awareness and utilization of twentieth century painting, and the effect of all this on his work. 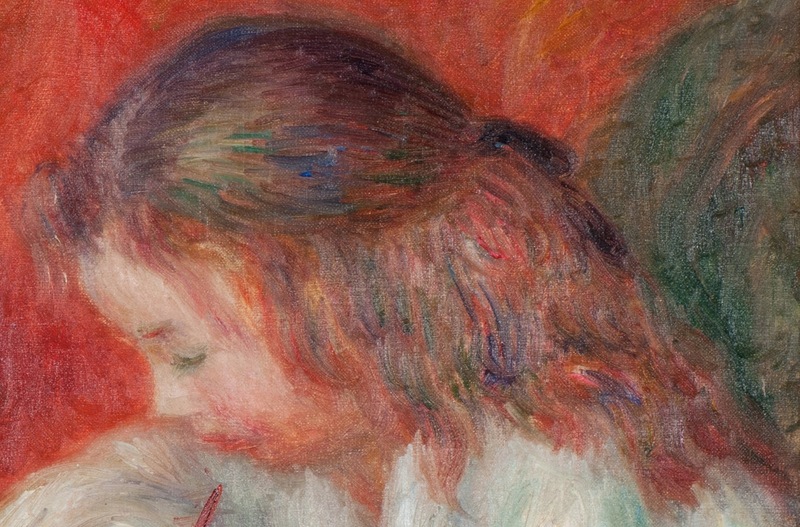 The uneven strands of hair and the red background in the Glackens painting add variety not seen in the Renoir which is uniformly laden with curves and colors of the same tonality. 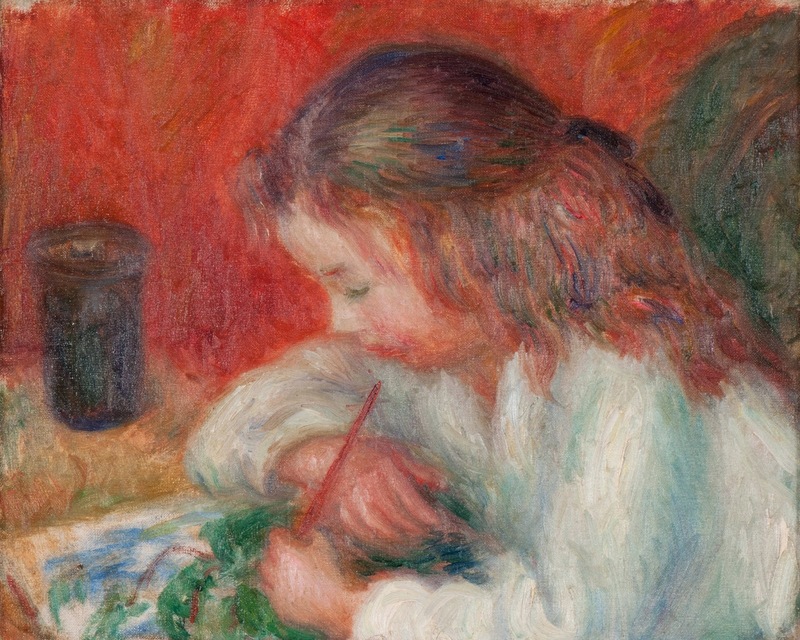 Also the cylindrical glass or pencil holder in Glackens's painting provides a single and interesting vertical focus as compared with the Renoir vertical hatchings that make up the wallpaper behind the child.